A new law in Georgia makes information about where the state got its supply of lethal injection drugs a secret. Several states are dealing with a shortage of lethal injection drugs and have had problems getting enough to carry out executions. In Georgia, lawmakers passed a measure that makes information about where the state got its supply a secret. The Lethal Injection Secrecy Act says that the identity of people or companies that manufacture, supply or prescribe drugs used in executions is a state secret. But attorneys for death row inmate Warren Lee Hill are challenging the state over whether that law is constitutional. Hill is on death row for brutally killing another inmate in 1990. Twice this month, he was scheduled to die by lethal injection, but his attorney Brian Kammer says it's unclear whether the drug acquired for the execution would work properly. "The drug is pentobarbital, and it was made at an out-of-state compounding pharmacy," he says. Asked if that's all he knows, Kammer says: "We know about compounding pharmacies generally, enough to stoke major concern." Compounding pharmacies are largely unregulated. And the drugs could be expired or tainted, Kammer says, which could cause a problem during an execution. A state judge has blocked Hill's execution, saying the law allows the state to withhold information that is essential in determining the effectiveness of the drugs. "Mr. Hill has a right to be free from cruel and unusual punishment," Kammer says. "In order to prove that, we need to have access to information about where the drug is coming from and how it's manufactured. And by blocking that information, even from court scrutiny, our argument is they're blocking us from the courthouse door." The state attorney general would not comment on the ongoing case. But at a hearing in July, Assistant Attorney General Sabrina Graham said there's no evidence the drugs are substandard. There's a good reason for the state to protect manufacturers' identities, she says. "Once that compounding pharmacy's identity is revealed, how will the Department of Corrections ever get another compounding pharmacy to sell to us?" Graham asks. "Certainly, how will we get a doctor knowing that he is going to be, or she is going to be, dragged into court?" Since 2010, when the only manufacturer of one of the drugs used in the process stopped making it, several states enacted secrecy laws. The next year, Georgia acquired some of its drugs from out of the country. But federal authorities seized the supply. The state then began using a new drug, pentobarbital, but it too is in short supply. South Dakota has a secrecy law similar to Georgia's, but it hasn't been tested yet. Other state laws are being challenged. And recently, a federal appeals court ruled that the Food and Drug Administration was wrong to allow Arizona and other states to import a lethal injection drug from overseas. States are having a tough time finding supplies, says Fordham University law professor Deborah Denno. But that doesn't mean officials should hide information about the process, she says. "If, in fact, these drugs are not problematic, then Department of Corrections should have no concern about revealing what their sources are," Denno says. In Georgia, Warren Lee Hill's execution is on hold until the judge can fully consider how much information the state can withhold. And there's another big legal issue here: Hill has an IQ of around 70. The state's doctors have changed their minds and now agree that he is intellectually disabled. Whether or not the execution drug issue is resolved, Hill's attorneys say he should be exempt from the death penalty. In Georgia, an execution is on hold as a court considers the constitutionality of a state law. The law makes information about the state's supply of lethal injection drugs a secret. That's intended partly to prevent disruptive protest at the places where the drugs are produced. Several states are dealing with a shortage of lethal injection drugs and have had problems getting enough to carry out executions. As NPR's Kathy reports, attorneys for one death-row inmate contend that the source of those drugs should be made public. 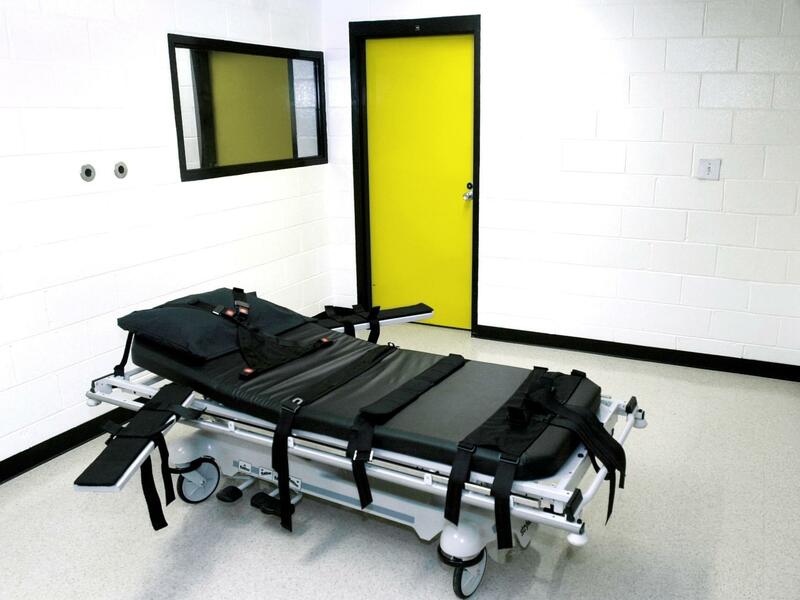 KATHY LOHR, BYLINE: The law says the identity of people or companies that manufacture, supply or prescribe drugs used in the executions is classified as a confidential state secret. The execution of inmate Warren Lee Hill was scheduled, but his attorney Brian Kammer says it's unclear whether the drug acquired for the execution would work properly. BRIAN KAMMER: The drug is pentobarbital and it was made at an out-of-state compounding pharmacy. LOHR: And that's all you know. KAMMER: We know about compounding pharmacies generally, enough to stoke major concern. LOHR: Compounding pharmacies are largely unregulated. Kammer says the drugs could be expired or tainted, which could cause a problem during an execution. Hill is on death row for brutally killing another inmate in 1990. A judge blocked his execution, saying the law allows the state to withhold information that is essential in determining the effectiveness of the drugs. Again, Brian Kammer. KAMMER: Mr. Hill has a right to be free from cruel and unusual punishment. In order to prove that, we need to have access to information about where the drug is coming from and how it's manufactured. And by blocking that information, even from court scrutiny, our argument is they're blocking us from the courthouse door. LOHR: The state attorney general would not comment on the ongoing case. But at a hearing in July, Assistant Attorney General Sabrina Graham said there's no evidence the drugs are substandard. Several states have enacted secrecy laws since 2010, when the only manufacturer of one of the drugs used in the process stopped making it. The next year, Georgia acquired some of its drugs from out of the country. But federal authorities seized the supply. The state then began using a new drug, pentobarbital, but it, too, is in short supply. South Dakota has a secrecy law similar to Georgia's, but it hasn't been tested yet. Other state laws are being challenged. And recently, a federal appeals court ruled the Food and Drug Administration was wrong to allow Arizona and other states to import a lethal injection drug from overseas. Law professor at Fordham University, Deborah Denno, says that states are having a tough time finding supplies but, she says, that doesn't mean officials should hide information about the process. DEBORAH DENNO: If, in fact, these drugs are not problematic, then Department of Corrections should have no concern about revealing what their sources are. LOHR: In Georgia, Warren Lee Hill's execution is on hold and there's another big legal issue here. Hill has an IQ of around 70. All the state doctors have changed their minds and now agree he is intellectually disabled. Hill's attorneys say whether or not the execution drug issue is resolved, he should be exempt from the death penalty. Kathy Lohr, NPR News, Atlanta. Transcript provided by NPR, Copyright NPR.